At least five days, if not a full week, is needed to really see this teeming city of 15 million-plus people, rich in history and alive with energy. 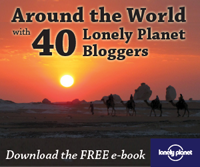 You can find a full spectrum of tips on transportation, hotels, restaurants, sights, shopping, and nightlife in the Istanbul Travel Guide I wrote in 2010 for the British website SimonSeeks.com. 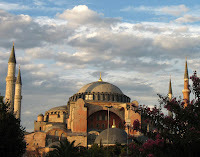 Aya Sofya (Hagia Sophia). It's on every tourist's checklist for a reason. Historically important and architecturally awe-inspiring. 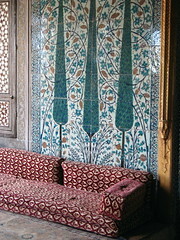 Topkapı Palace. The seat of Ottoman power, it's full of lavish decor and eye-popping treasures. How the sultans could have thought the "modern" Dolmabahçe Palace was an upgrade is anyone's guess. Bosphorus Cruise. Don't skimp; take the full-day cruise from the Eminönü "Boğaz İskelesi" ferry port all the way up to Anadolu Kavağı, where you can hike up to a ruined fortress overlooking the Black Sea and eat fish by the waterfront. there, take a ramble around the old city walls. Rumeli Hisarı. 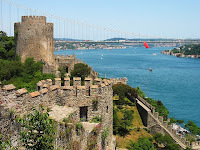 Impressively preserved fortress with sweeping Bosphorus views. Pair with a large and leisurely breakfast at one of the cafes below the walls. The Princes' Islands. The traditional summer playground of Istanbul's elite, it can be your escape from the city too, for just the price of a ferry ticket. Eat an ice cream cone, take a horse-drawn carriage ride, or just stroll around, enjoying the fresh air in the absence of cars. boys dressed like little kings--they're on their way to get circumcised. Eyüp also makes an excellent starting point for explorations along the Golden Horn, including the historical neighborhoods of Balat and Fener, and the waterfront Bulgarian iron church. Eminönü. Dive into the streets behind the Spice Market and join the throngs shopping for kitchenware, coat hangers, cheap clothes, spices, gardening supplies -- whatever you're looking for, it's probably in Eminönü. 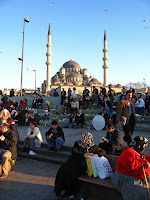 Afterward, stroll over the Galata Bridge, stopping midway for a beer on the lower deck while you watch the boats go by. Taksim. The volume of people out until all hours of the night on the pedestrian thoroughfare İstiklal Caddesi has to be seen to be believed. Don't leave Istanbul without at least one rakı-fueled meyhane meal on Nevizade Sokak. Various visitors have reported happy stays at the Kybele Hotel, the Empress Zoe Hotel, and the Santa Ottoman Boutique Hotel. If you'd rather rent an apartment for the duration of your stay, your man is Ibo Abi ("big brother İbo"). A good friend of The Turkish Life, he manages a variety of rental apartments, mostly in the Beyoğlu area. If he doesn't have anything that fits your needs, other recommended options are Istanbul Sweet Home and 1001 Nites. Parents traveling with children should check out Hotel Momcierge, run by another friend of The Turkish Life. This new venture offers family-friendly services such as rental cribs and other gear, babysitters, baby-proofing, transport, and itinerary planning.